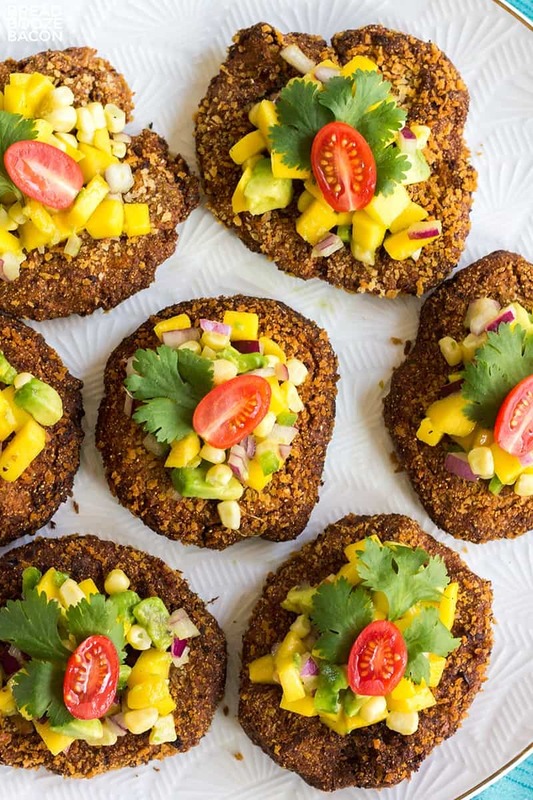 Spice up your meal with Mexican inspired Black Bean Cakes with Corn-Mango Salsa! These crispy cakes are delicious, easy to make, and topped with a fresh salsa that’ll make your taste buds dance! I have this thing with Mexican food. Maybe it’s because I grew up in the Southwest and there are all these great hole-in-the-wall places to eat at or the combination of flavors that calls my name. Either way, I have a major crush on Mexican foods. 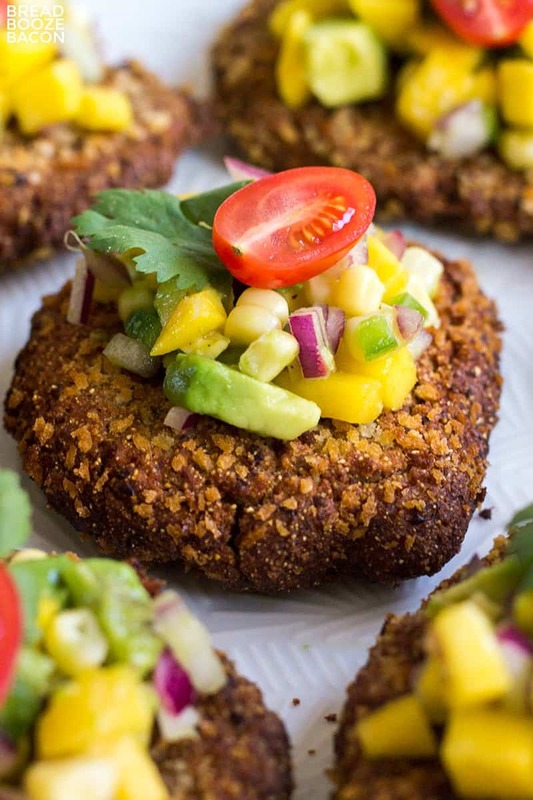 Today I’m running with it to make this killer Black Bean Cakes with Corn-Mango Salsa recipe! This recipe is straight from my trip to Iowa last month and boy is it good!! 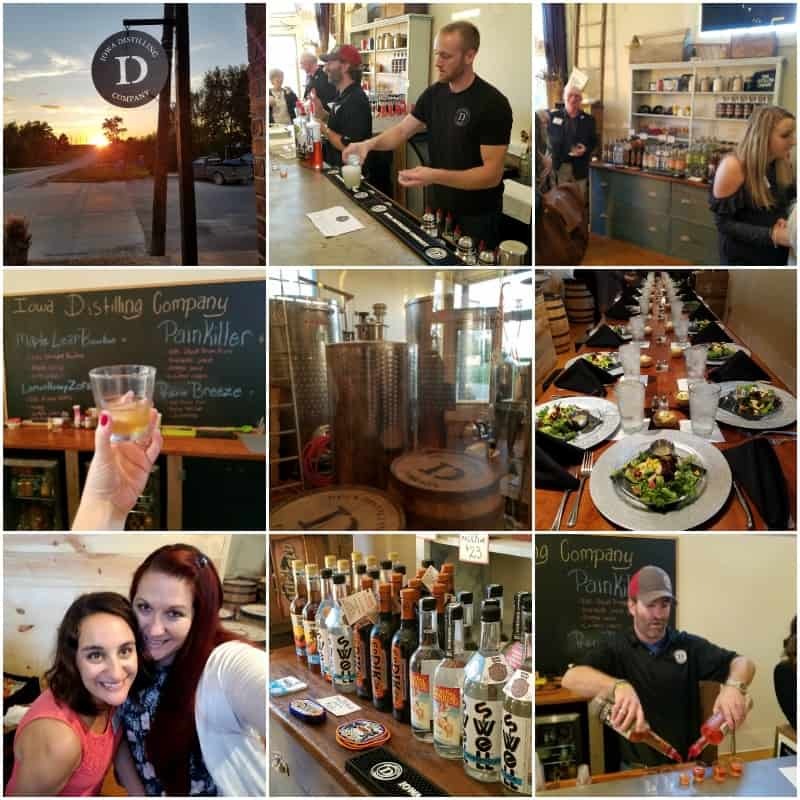 I was lucky enough to visit Des Moines with some of my favorite bloggers in September. A big giant thank you to Iowa Corn for sponsoring this trip, this post, and fueling my love of corn even more! If you love corn as much as I do, you’re in luck. I learned more about corn than I ever thought I would in my entire life and I’m spilling the goods. I was over the moon happy for this trip. After blogging forever, I was finally going to get to meet some of my favorite ladies that I’ve been online friends with for years and hug them and have their faces by my face. Ahhh! When we arrived we were whisked off to the gorgeous Des Lux Hotel. Everyone’s rooms were unique and the staff was so nice. 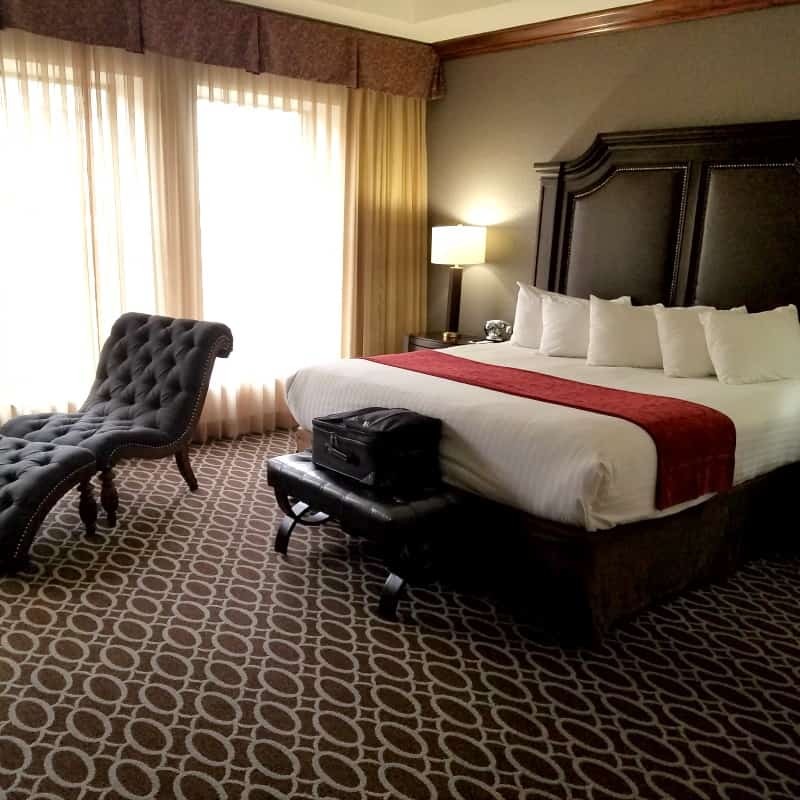 I’d definitely hit up this hotel again in a heartbeat! The trip started off with a visit to Iowa Distilling Company. I was like a compass near north. We had a wonderful cocktail hour with corn focused appetizers and some delicious cocktails with Iowa Distilling’s finest spirits. From the bourbon that was served to our dinner, there was corn in everything. 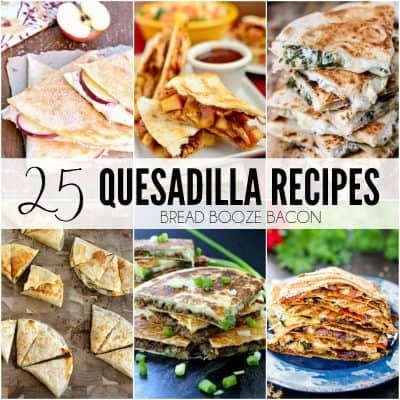 Right up this food blogger’s alley! At dinner, we were able to talk to the Iowa corn board and hear why they’re passionate about the corn industry in Iowa and their backgrounds in farming. Then it was time to jump on the bus and head out to the Blair and Kenney farms. I’m a city girl and haven’t really been around farms. My closet contact would be the cornfields down the road from my house and the citrus groves in Mesa where I grew up. Our visit to both farms was so enlightening. The Blair family has calves, cows, hogs, corn, and soybeans. 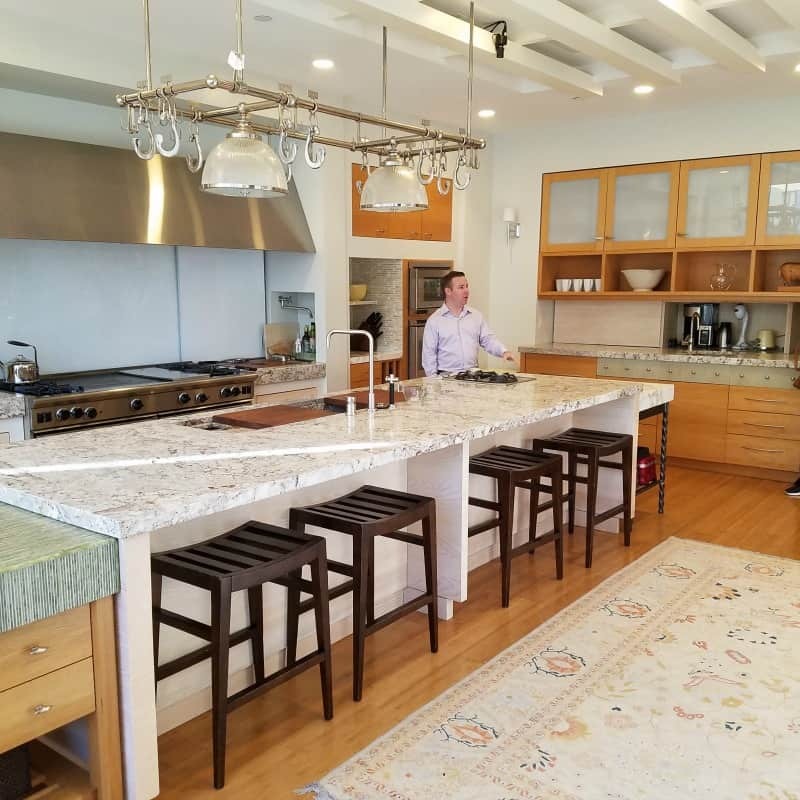 It was really eye-opening to me seeing how much sustainability happens at the farm. The corn grown gets sold for ethanol or livestock feed purposes and then comes back to the farm as distiller’s gain or corn gluten to be added to the animals’ food mix. Then the manure from the animals can be used to help fertilize the crops. It’s a big circle of resourcefulness. And the cows & calves were super cute. But seriously, the passion and dedication of these farmers to make sure what they put into their crops and get out of them is amazing. Every season they try to do better than the last, and not just in the yield, but in finding the best ways to nurture the ground and environment of their farm. The Blairs know that what they produce is what we’re all consuming and it’s a big deal for them. At the Kenney farm, we saw harvest up close and personal. The combine was in action harvesting soybeans. Most corn farmers also grow soybeans, who knew?! Everyone in Iowa. 😉 The Kenneys farm about 3,000 acres and make a huge effort to what’s best for the land they have. Whether that means growing a cover crop to help the ground when their corn or soybean crops aren’t laid down, or not planting in an overworked area of ground. They’ve been farming for generations and shared stories of their grandparent’s farming life. I couldn’t believe how different farming is today and so happy the same toxic chemicals don’t’ need to be used with the GMO technology we have today. The farmers are safer and so is our food. After a quick change at the hotel, we headed over to the Iowa Speedway. We met with Iowa Speedway president Jimmy Small to learn about how Iowa Corn and ethanol is making a difference at the racetrack. 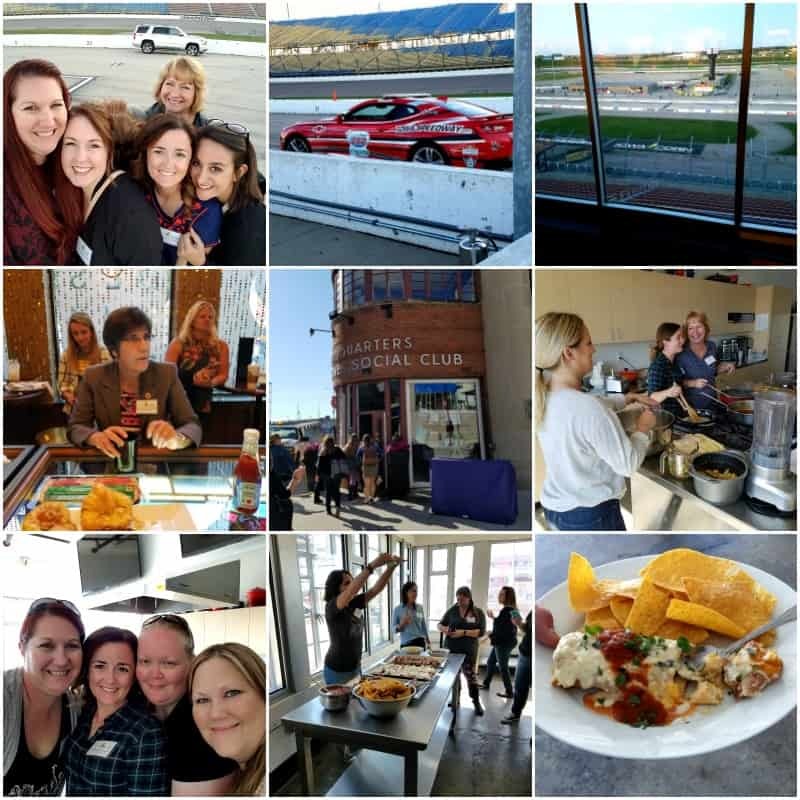 We each got to take a spin around the track in the paces cars and then headed upstairs to have dinner in one of the suites with the American Lung Association. I had no idea, but I have a flex fuel car that can use E-85 gas. Apparently, the yellow gas cap is the indicator. I hunted down an E-85 gas station near my house and started filling up there. This cleaner burning E-85 gas is a big boost to the air we breathe and even most cars are E-15 compatible. The things you learn when you go to Iowa. Sunday morning, we had breakfast with Dr. Ruth MacDonald from Iowa State. I could listen to Dr. Ruth talk all day. We discussed clean food labels, how marketing is influencing the labels on our food & what they really say, and had a lot of food myths debunked. Learning about high fructose corn syrup was completely fascinating to me. With all the bad press it gets, there’s chemically no difference between high fructose corn syrup and sugar. So really it’s about how much is going into things and how much we’re consuming. We talked about portions, GMO’s and how they related to farming, color dye enhancements in food, and even one of food studies that caused consumer up rise even though there was really no founding. Blew.My.Mind. After talking with Dr. Ruth, we walked over to Des Moines Social Club. Did I mention the weather was beautiful? We met Chef Cassie to put our cooking skill to the test. We divided into 3 teams and had a really fun Chopped style cooking challenge. Each team was given corn, mangoes, and chicken livers and 45 minutes to make something delicious. My team had Sandra from A Dash of Sanity, Jamie from Love Bakes Good Cakes, and Kristin from Yellow Bliss Road. Sandra had the brilliant idea to make a black bean cake with pureed chicken livers and we decided a bright salsa would be a great topping. It was a team effort and in the end I think we really made something delicious. There was an official judging of all three dishes and my team won! It was a blast to cook with everyone!! As much as food bloggers cook, we don’t get to do it together too often. Today we’re making our winning dish…without the chicken livers. You couldn’t taste them in the final recipe, but I decided hummus would be a better add in and more accessible. I went to three different stores for chicken livers. Nothing. So hummus it is! This was an amazing trip! I’m so glad I went and got to see the versatility of one of my favorite food ingredients. 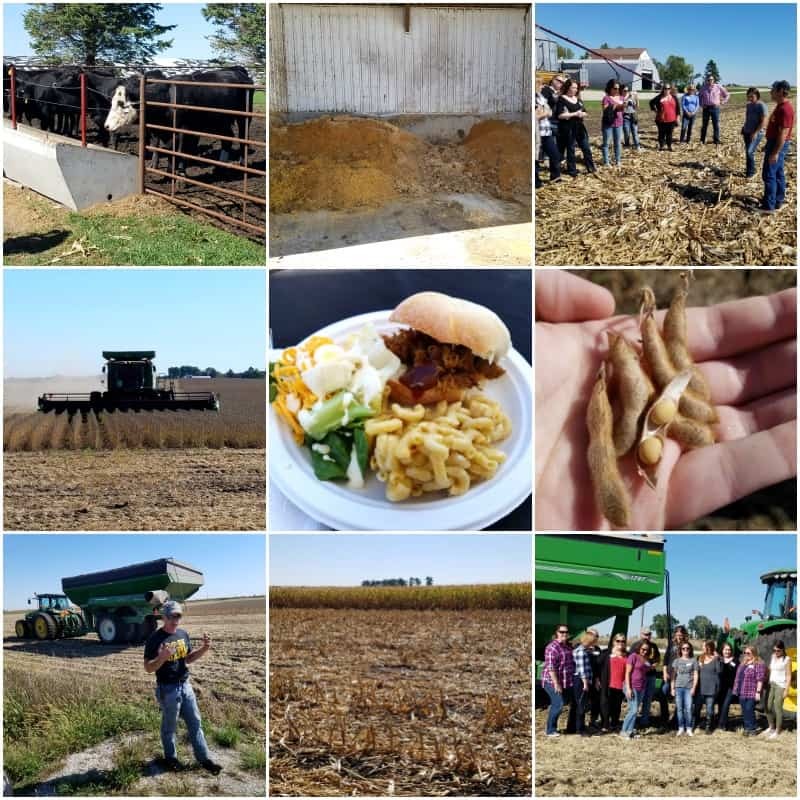 If you have a chance to go to Iowa and learn more about the farming community there and their passion for corn, do it. You won’t be disappointed. 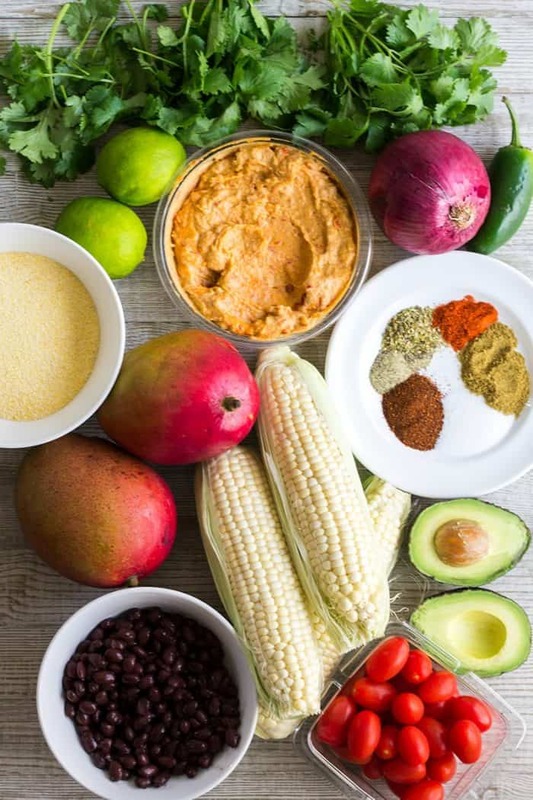 Spice up your meal with Mexican inspired Black Bean Cakes with Corn-Mango Salsa! These crispy cakes are delicious, easy to make, and topped with a fresh salsa that'll make your taste buds dance! Heat oil in a large skillet over medium-high heat. Place black beans and hummus in a food processor. Pulse until smooth. Scrape sides of the bowl as needed. Transfer the puree to a mixing bowl. Add corn meal, egg, chili powder, cumin, salt, oregano, cayenne, and pepper. Mix until evenly combined. Portion the cake mixture into 1/4 cup portions and form into small cakes. You'll want them on the thicker side as they spread a bit while being coated. Pour the breadcrumbs onto a plate and spread into an even layer. Dredge the cakes in bread crumbs, coating each side.Add cakes to the hot oil, working in batches as needed. Cook for 2-3 minutes per side until crispy, flipping once. Transfer to a paper towel-lined plate to drain. 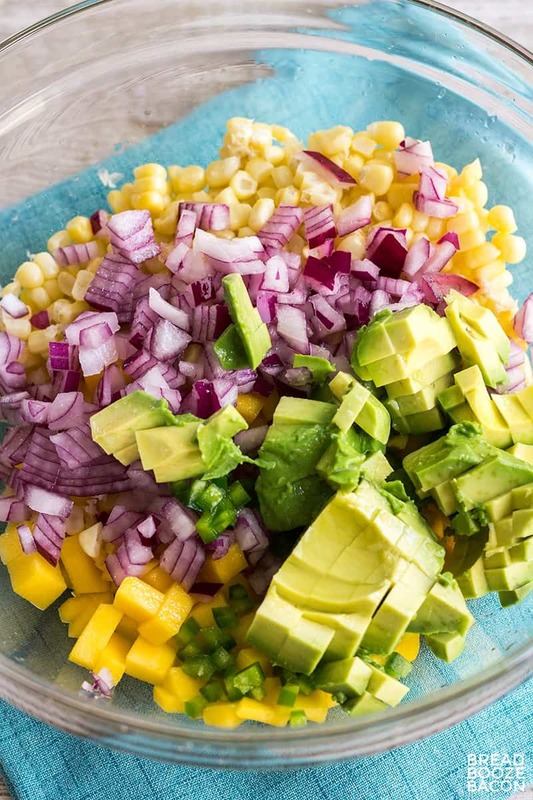 To a medium mixing bowl, add mango, corn, avocado, onion, jalapeno, cilantro, lime juice, salt, and pepper. Stir to combine. Check seasoning and adjust as desired. If you're feeling adventurous, take out the hummus and substitute 1 cup raw chicken livers in with the black beans when you make the puree. when do i add the chicken liver? I think I like the hummus instead. The liver is kind of pricey around here. Looks really good though.